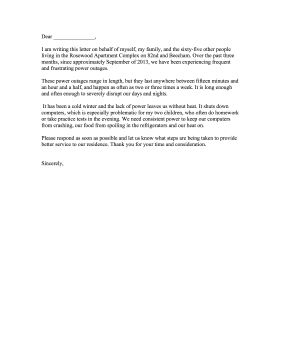 This power outage complaint letter can be aimed at an electric company, landlord, or utility worker. I am writing this letter on behalf of myself, my family, and the sixty-five other people living in the Rosewood Apartment Complex on 82nd and Beecham. Over the past three months, since approximately September of 2013, we have been experiencing frequent and frustrating power outages. These power outages range in length, but they last anywhere between fifteen minutes and an hour and a half, and happen as often as two or three times a week. It is long enough and often enough to severely disrupt our days and nights. It has been a cold winter and the lack of power leaves us without heat. It shuts down computers, which is especially problematic for my two children, who often do homework or take practice tests in the evening. We need consistent power to keep our computers from crashing, our food from spoiling in the refrigerators and our heat on. Please respond as soon as possible and let us know what steps are being taken to provide better service to our residence. Thank you for your time and consideration.